Color inkjet print, 40 x 30 in. Digital print and color pencil on paper, 54 1/2 × 22 1/2 in. For generations, artists have used text and books to challenge the purveyors of knowledge and to trouble the certainty of facts. Books are often thought about, researched and developed at the expense of marginalized groups, especially black people. Working with text and books, many artists seek to subvert historical paradigms of narrative control and dissemination of knowledge. These artists’ methods include physically breaking down the medium, pushing the scope of text and blurring the lines of the written word and the visual landscape. Excerpt explores how artists use books and language as a form of resistance, putting pressure on the way knowledge is written and shared. Through reworking our reading, these artists provide new understanding for themselves and viewers. 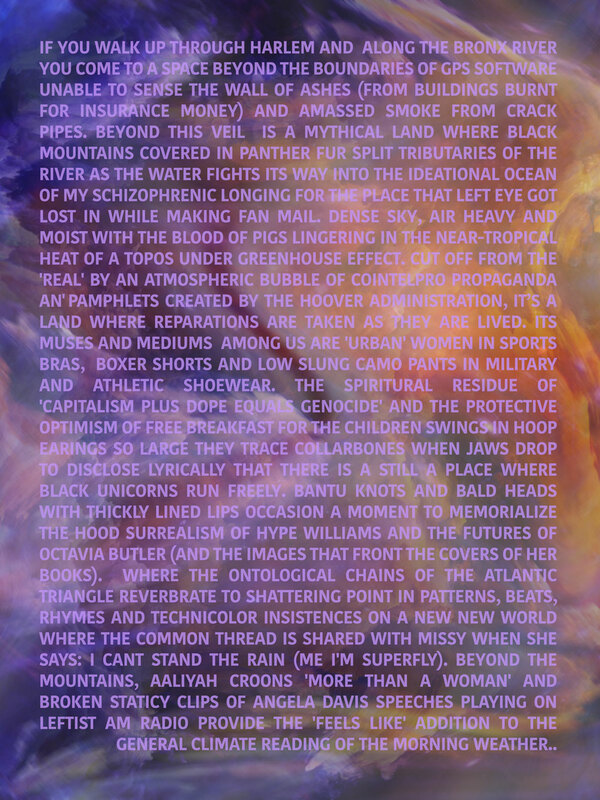 Excerpt features approximately fifteen artists. Alumni of the Studio Museum’s Artist-in-Residence program, including Sadie Barnette, Bethany Collins, Meleko Mokgosi and Xaviera Simmons, figure prominently in the exhibition, along with Glenn Ligon, Gary Simmons, Kara Walker and more. Excerpt is organized by Adeze Wilford, The Studio Museum in Harlem/MoMA Curatorial Fellow.